c) Riog Green demonstrated the use of a simple device consisting of a disposable 25-gauze dental needle, a segment of thin steel wire and a small mosquito hemostat to remove silver cones from the root canals. 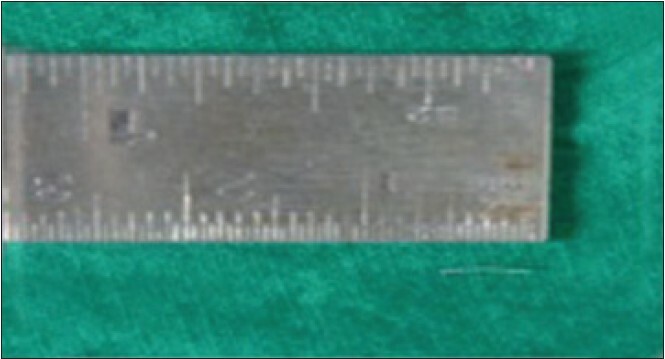 d) Fors and Berg described a technique that required removal of internal root structure before the instrument is removed. f) Ultrasonic scaler has been used to remove solid objects from the root canal. h) Taintor et al. described various methods for the removal of silver cones. With a more frequent use of nickel titanium rotary files in Endodontics, the incidence of file separation within the canals has increased. When the file is broken at the apex, the microscope cannot be of help. If the file breaks within the coronal half of the canal, then the microscope is essential to guide the clinician to retrieve the broken files. In this manner, the broken file can be removed while minimizing the damage to the surrounding dentine. A 37 year old female patient came to the Department of Conservative Dentistry and Endodontics with the chief complaint of pain in lower left back region. 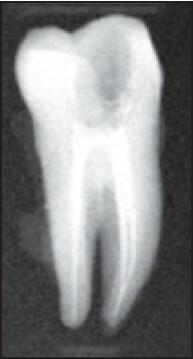 Pre-operative radiograph [Figure 1] revealed radiolucency involving enamel, dentine and pulp with periodontal widening and radiolucency in mandibular second molar region. Conventional pulp space therapy was proposed. Access cavity was prepared and during the course of biomechanical preparation, a 25 size K-file got separated at the apical region of the mesiobuccal root canal. 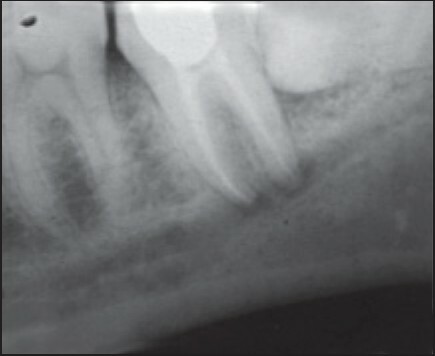 On radiographic examination, the separated instrument was protruding 3 mm beyond the apex approximating the mandibular canal [Figure 2].The patient was informed about the instrument inside the canal and ill-effects of keeping it untouched since it was protruding beyond the root apex. She was also explained the different techniques with which an attempt can be made to remove the instrument. The advantages and disadvantages of various techniques were explained to the patient in detail. The patient declined for Periapical surgery and other options however she gave her consent for intentional replantation. Cleaning and shaping was completed for distal and mesiolingual canals. Both distal and mesiolingual canals were obturated. In the pulp chamber, a cotton pellet was placed and was restored with composite. Orthodontic bands were prepared. 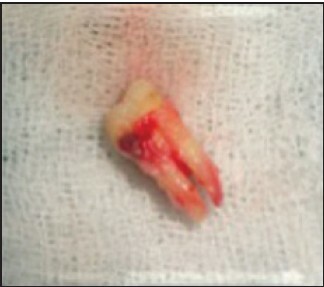 Under aseptic conditions, atraumatic extraction was done and the entrance restoration was removed [Figure 3]. Extra orally, the separated instrument was retrieved. It measured around 7 mm [Figure 4]. The mesiobuccal canal was cleaned, shaped, and obturated [Figure 5]. The tooth was re-implanted. 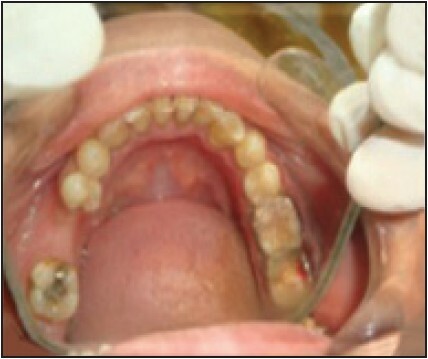 For the stabilization of this re-implanted tooth, orthodontic bands were placed on both first and second molars and the bands were cemented with Zinc Phosphate cement [Figure 6]. Entrance filling was given with Glass Ionomer Cement. 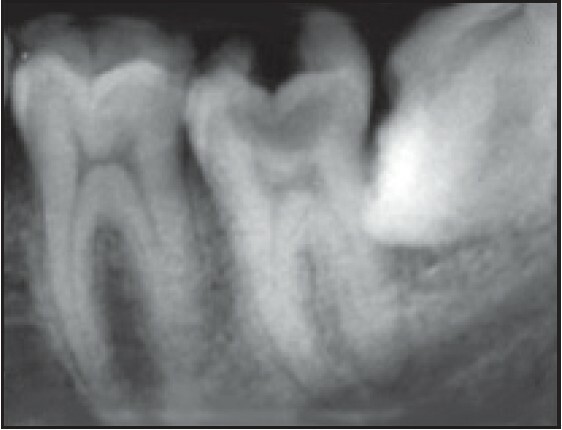 Post-operative radiograph was taken to confirm the position of tooth [Figure 7] and [Figure 8]. 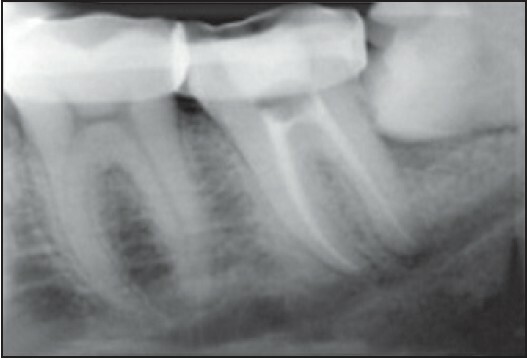 Band was removed after 4 weeks and radiograph taken for the evaluation of Periapical region [Figure 9]. 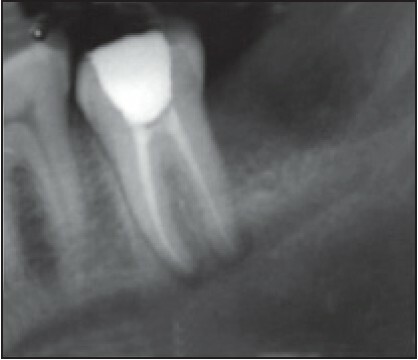 Periodic evaluation was done after 1 month [Figure 10], 3 months [Figure 11], and one year [Figure 12] and [Figure 13] for further evaluation and there was reduced Periapical radiolucency. Cone beam computed tomography [CBCT] has been used in endodontics for an effective evaluation of the root canal morphology along with the diagnosis of endodontic pathology, assessing root and alveolar fractures, analysis of re-absorptive lesions, identification of non-endodontic pathology, and pre-surgical assessment before root end surgery. , The cone beam computed tomography, if available can be of use to know the proximity of the instrument to the mandibular canal. However, this equipment is not available everywhere. There are some advantages in performing an intentional replantation when compared to the Periapical surgery or when surgery is refused. Replantation is less invasive and less time consuming. If the case selection is proper the replantation can be simple and straightforward. The chance for damaging the nerve is also very less here. Many authors has advised that replantation should be considered as a last option after all other options fail or are likely to fail. Since the separated instrument was inaccessible through non surgical means an intentional replantation was considered in our case report. Some studies have shown that the average time of retention after replantation is 3-5 years. The main reason for failure after replantation is due to replacement resorption. This is directly related to the amount of time that the tooth was out of the mouth during the procedure and before replantation. If the extraoral time is very brief and there is very little damage to the cementum or periodontal ligament during extraction, then the prognosis is much better for the reimplanted tooth. As mentioned before, in our case report, an atraumatic restoration was done and the tooth was replanted within a very little time and was splinted. Prevention is the best antidote for a separated file in the canal. Adhering to proven concepts, combining the best strategies and making use of safe techniques during root canal preparation procedures will virtually eliminate the separated instrument procedural accident. Separation of instrument can be prevented if the instruments used for negotiating and cleaning and shaping the root canal are disposed and not reused. 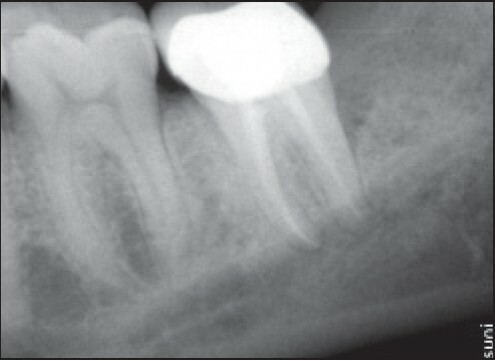 Discarding all instruments after the completion of each endodontic case will reduce breakage, lost clinical time, and upsets caused by procedural accidents. However, on occasion, an instrument might break and in spite of the best existing technologies and techniques, the retrieval may not be successful. In these instances, and in the presence of clinical symptoms and/or radiographic pathology, surgery or extraction may be the best treatment option. 1. Parashos P, Messer HH. Rotary NiTi instrument fracture and its consequences. J Endod 2006; 32:1031-43. 2. Schulz J, Gutterman JR, Cohen S, Burns RC. Pathways of Pulp. Non surgical endodontic treatment. 10 th ed: Mosby; 2010. p. 890-950. 3. Chandra BS, Krishna VG Grossman's Endodontic Practice. Procedural errors: prevention and management. 12 th ed: Wolters Kluwer and Lippincott Williams and Wilkins, India, 2010. p. 469-93. 4. Pai AR, Kamath MP, Basnet P. Retrieval of a separated file using Masserann technique: A case report. Kathmandu Univ Med J (KUMJ) 2006;4:238-42. 5. Plotino G, Pameijer CH, Grande NM, Somma F. Ultrasonics in endodontics: A review of the literature J Endod 2007;33:81-95. 7. Weine FS. Endodontic Therapy: Endodontic Emergency Treatment. 5 th ed. Mosby-year book, Inc 1997. p. 203-30. 8. Lindhe J, Nyman S. The role of occlusion in periodontal disease and the biological rationale for splinting in treatment of periodontitis Oral Sci Rev 1977;10:11-43. 9. Amsterdam M, Fox L. Provisional splinting - principles and techniques. Dent Clin North Am 1959;3:73-99. 10. Nair MK, Nair UP. Digital and advanced imaging in endodontics: A review. J Endod 2007 1-6. 11. 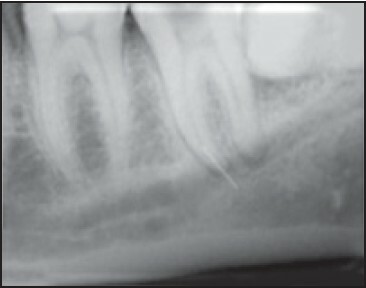 Matherne RP, Angelopoulos C, Kulild JC, Tira D. Use of cone-beam computed tomography to identify root canal systems in vitro. J Endod 2008;34:87-9. 12. Benenati FW. 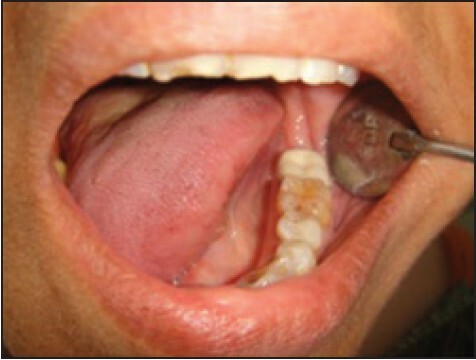 Intentional replantation of a mandibular second molar with long-term follow-up: Report of a case. Dent Traumatol 2003;19:233-6. 13. Peer M. Intentional replantation-a last resort treatment or a conventional treatment procedure? Nine case reports. Dent Traumatol 2004;20:48-55.